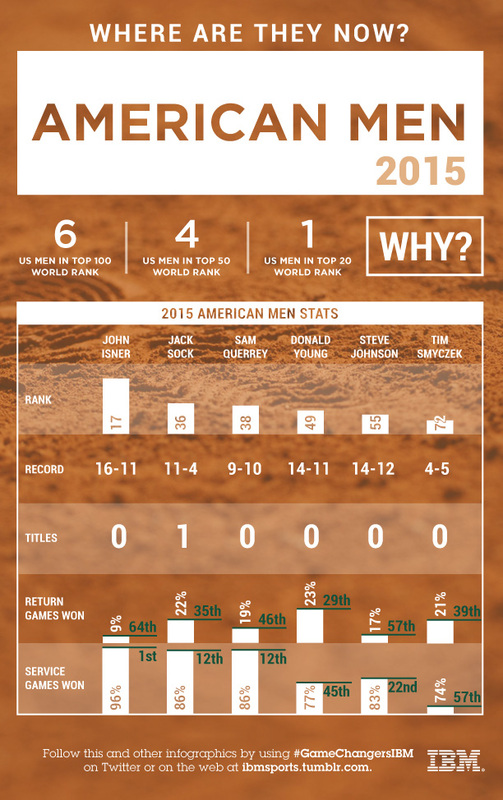 Daily Data Viz: How will the American men fare in Paris in 2015? The top American men on the ATP tour—John Isner, Jack Sock, Sam Querrey, Donald Young, Steve Johnson and Tim Smyczek—rank in the top 100 in the world, but their chances at a French Open title are slim based on the stats from this year. The top American men on the ATP tour—John Isner, Jack Sock, Sam Querrey, Donald Young, Steve Johnson and Tim Smyczek—rank in the top 100 in the world, but their chances at a French Open title are slim based on the stats from this year. Between the six men, only one (Sock) has won a title in 2015, though Isner ranks first in the ATP on service games won (96%) and Sock and Querrey are both tied for 12th (86%). How will the American men fare in Paris in 2015? Check SI.com's French Open data hub page throughout the whole tournament for the latest data-driven infographics and charts from IBM, the official technology partner for the French Open. IBM captures and analyzes the data that powers all of the Grand Slams, as well as the digital platforms that extend the experience to fans around the world.